Belgium? Liège? My weekend across the border turned out to be my least interesting in recent years in Belgium. So I just want to post a few words before moving on to more fun times at the open mics in Paris in the coming days. The whole trip from Thursday to Sunday in Liège might have taken another turn, but the new open mic/jam session that I seemed to notice on the Internet on Thursdays was impossible for me to attend, as I had an important meeting Thursday night for my job (which is why I’m sent there in the first place!)…. First bit of jamming at the Blues-Sphere in Belgium. Second bit of jamming at the Blues-Sphere in Liège. That was a disappointment, obviously, as the rare number of open mics in Liège seems to have been diminished even more – although I’ll have to confirm that before removing the Surlet from my open mic list for Liège. I then walked up the street to the Blues-Sphere bar, which has one of the city’s best known jam sessions, on Friday night. //platform.twitter.com/widgets.js“>A moment of me playing in the public square in Liège, caught and tweeted by one of my colleagues. But entering the bar for probably the fourth year in a row I was still recognized by no one, and when I asked for a beer and noticed that they practically only had Leffe on draught, I said I wanted any beer at all except Leffe. So the guy served me some kind of strawberry or raspberry flavored beer, which I felt was a reaction to what he took for a not-very-macho dislike of Leffe! I took it as an insult, but made no comment, and simply drank the beer, which was nevertheless tasty as a fruit juice. So I finished my beer when their set ended, and I left without anyone saying a word to me about whether I wanted to play or not. No problem. The Blues-Sphere is a very cool club, but not really for me this last weekend – despite having spent some cool nights playing there, maybe twice on stage as I had come too late last year, I think…. Still, I never give up on my open mic mission attending the Formula One races, and on Saturday night I went out to dine with some colleagues, and brought my guitar with me – just in case, and as I always do when checking out the terrain. We had a fabulous meal in an Italian restaurant, and then went bar-hopping in the Carré district, and on the way back to the hotel I suddenly felt the inspiration and need to whip out the guitar and play a few songs in a public square. I was then joined by a local North African guy who did a rap in French while I played the backing sound on the guitar – my Gibson J-200. That moment in the square was more fun than anything I’d have done at either the Surlet or the Blues-Sphere, so I considered the musical part of the weekend to be a success of a kind after all…. But not the kind I really seek out at open mics. Liège seems to be dying, musically…. 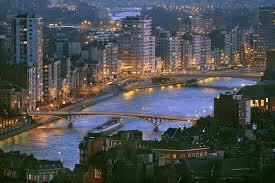 LIEGE, Belgium – For my 12th city installment of my worldwide open mic guide today I am loading my Liège, Belgium page. As a reminder, it all started with my now very popular Thumbnail Guide to Paris Open Mics, Jam Sessions and other Live Music, and due to that guide’s success, I decided this year to do a similar guide for each of the cities I travel to during my worldwide open mic tour. You might not expect that Liège would be such a lively city musically, but there is music all over, and jams sessions in bars aplenty. The problem is the jams are constantly changing location, and they start and fold at an even greater rate than in many larger cities, in my experience. For the moment, I have only a couple of places on my list. I have been unable to find out if the third place I intended to visit this weekend is still operating its jam, but if I find it is, I will add it to the list. I may in the near future also decide to add the couple of open mics I know of in Brussels. But in the interest of getting this edition of the guide set up now, while still in Liège, I am putting it up with the only two open mice/jams I currently am sure of. So here, now, in any case is the Thumbnail Guide to Liège Open Mics, Jam Sessions and other Live Music. Please do help me whenever you have information to give me on venues. Suddenly three days appear to have disappeared on the Weblog. No, I have not become a slacker. I did actually attend the Ptit Bonheur la Chance open mic on Tuesday night, but I had much work to do to prepare for my trip to Belgium – where I write these words – and a slow internet connection here and there. And then there was drive from Paris to Belgium. The result is not a weblog but a backlog. But great stuff at the Ptit Bonheur, and a little letdown and a bit of bonheur in Belgium. I was particularly happy on Tuesday evening to see my favorite Paris poetess, the wonderful Lisa Marie Guilbot, who writes clever and piercing short poems mostly about love – of one kind or another – and who has a very enticing reading delivery of the poems. She goes to Ollie’s open mic occasionally and it’s always a nice break from the music. This time Ollie was on holiday and it was Rachel Crocker (it should be “Rocker”) who did the MCing, and who opened with her cool songs accompanying herself on the ukelele. I uploaded a video of her too, but somehow the lousy internet connection meant it did not make it…. The other amazing and wonderful meeting at the Ptit Bonheur la Chance was with Fabien Fabre. I had seen this guy at another open mic several times, and he stands out enormously as he is virtually the only performer who specializes in a weird and wacky humorous singing and songwriting. We spoke for a while and I learned that he is not only an open mic addict, but he is an artist of the bicycle. Fabre makes extraordinary bicycles out of pure materials. Check out his stuff at Fabien Fabre Bicyclettes. Upon arriving in Liege, Belgium yesterday, however, I learned that the jam session I intended to attend at the famous Bouldou bar was not taking place in the summer, and I’m not even sure it will continue. I also learned the terrible news that the Art Cafe closed down. This Art Cafe jam was the open session I had hoped to take part in on Sunday evening, as it was a high point of my musical adventure in Liege last year and the year before. The Art Cafe ran into the same problem facing such musical venues and bars in so many parts of the world – what is really hurting Paris too – that residents wants cities to be quiet now so bylaws are being written and enforced to cut out live music. And close down the bars and venues if they don’t obey – or the places close down because they cannot afford to do the work needed to make the bars soundproof. The good part of the whole story was that I did meet up with Raph Charron again. He is the one I speak of in the post on the link above, describing my experience at the Art Cafe last year. Raph and I talked music at Bouldou and then managed to shoot a video interview for my open mic film, with Raph reminiscing on the Art Cafe and talking about the music scene in Liege.